"Severe income inequality" is the biggest global risk, according to a panel of experts assembled by the World Economic Forum. The group points to "chronic government debt" as another problem threatening the world during the next 10 years. The report also worries about "the dark side of connectivity" with its threat of "devastating cyber-attacks". Global warming, failure of regulation and population growth are identified as three other top risks. 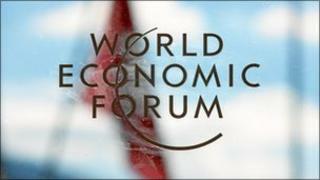 The Global Risks 2012 report was published in the run-up to the World Economic Forum's annual meeting at the end of this month in the Swiss mountain village Davos, which will bring together some of the world's top business leaders and politicians for five days of discussions and negotiations. This year's report shows a shift away from worries about the environment to concerns about a breakdown in society and economies. John Drzik, the chief executive of Oliver Wyman Group and one of the report's lead authors, said a "cluster of demographic and fiscal trends" were "colliding to create future severe risks". Progress in one area of society - for example, better health care - was "putting further pressure on other areas" such as the security of the world's retirement systems. Population growth and scarce resources, especially water, are identified by the report as being among the world's biggest problems. Many risks, Mr Drzik said, were also "amplified by the global economic crisis". People's expectations would not be matched by the ability of societies to deliver, he warned. "In many areas, the numbers are just not adding up." The report speaks of "seeds of dystopia" in a world where "for the first time in generations, many people no longer believe that their children will grow up to enjoy a higher standard of living than theirs," according to Lee Howell of the World Economic Forum. Nationalism, populism and protectionism could be the result, undoing what the forum describes as "the progress that globalisation has brought". The report issues a stark warning that many of the safeguards put into place just are not good enough to cope with risk. "We have to avoid using yesterday's solutions to address today's risks," warned David Cole, chief risk officer of re-insurance giant Swiss Re. The aftermath of the Japanese tsunami, for example, had shown how past policies and institutions could fail to protect people in a more complex and interdependent world. "We've seen examples of over-regulation, like the response to the Icelandic volcanic eruptions, or under-regulation, such as the sub-prime or eurozone crisis," Mr Cole said. Safeguards should be "anticipatory rather than reactive" and regulations should be "made more flexible to effectively respond to change". One of most devastating threats, however, is also one of the least predictable. The report notes that our "daily lives are almost entirely dependent on connected online systems", which had brought the world huge economic benefits and personal freedoms. The Arab Spring had demonstrated the benefits and power of "interconnected communications services," said Steve Wilson, chief risk officer for general insurance at Zurich. However, the same technologies also had a "dark side", helping to organise the riots in London and providing the ability to "unleash devastating cyber-attacks remotely and anonymously". The complexity of a world with six billion connected devices was "completely mind-boggling", said Mr Wilson. For governments, societies and businesses, it had become both "difficult to understand the complexity and how to manage its risks". Cyber-attacks were not a risk, but a daily occurrence, he argued, while "systems that we thought mitigate risk are actually concentrating risk, and these are risks that we do not fully understand yet".